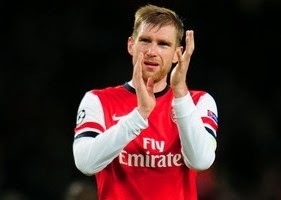 Per Mertesacker has revealed that he will be happy with a new contract at Arsenal. The German international centre back intends to make the most of his consistent form to help drive the Gunners on to success both in the Barclays Premier League and in Europe. The 29 year old said : “The first year was tough for me, a very tough challenge, but the club and the manager always trusted me in a special way,”. “I think it is a little reward that we are talking (about a new contract), because I still have one-and-a-half years left. Mertesacker joined the Gunners in 2011 from Bundesliga side Werder Bremen and has gone on to make a total of 89 appearance in all competition scoring 4 goals along the way.